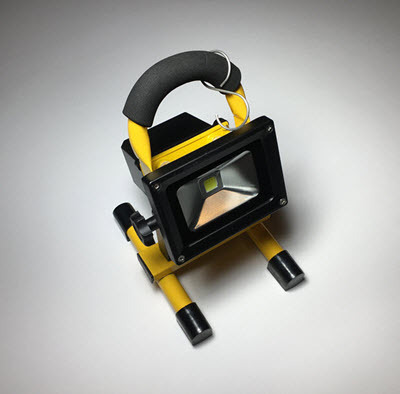 LED portable 12 volt work light fixture that allows you to take a bright LED to nearly any location. It's a work light that can operate 5 hours on a charge. It has a long life of 70,000 hours and will need little maintenance over the many years of service it will provide. It can replace higher wattage light sources because of it's high powered LED array saving you money a generating an excellent payback on the initial investment. Because this can run on DC voltage, it can be the perfect type of light that's going to give you high light output in situations where you may only have a battery to run it. This could be something like a camping situation or someplace that's off the grid and you need to have that kind of quality light. It's a bright light with 800 lumens that's going to give you a good punch of light far more than some simple small LED lights that really are lacking. And because it comes in a portable style, this will be a comfortable like to use in almost any situation where you don't have line voltage to plug into. It's completely portable and it's something that can be used outdoors anywhere and even be directly rained on as it is completely sealed from water and bugs. - 5 hour use time full blast. - Can be used while charging. - Replace existing fluorescent and HID flood lights. - USB 5-volt charging port. - Comes with plug-in and car charging accessory.